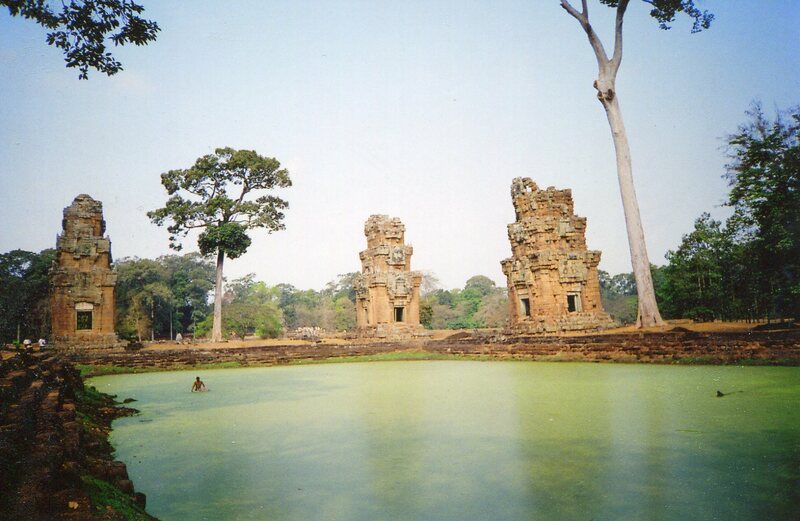 What are those mysterious buildings behind that old Khmer pool? 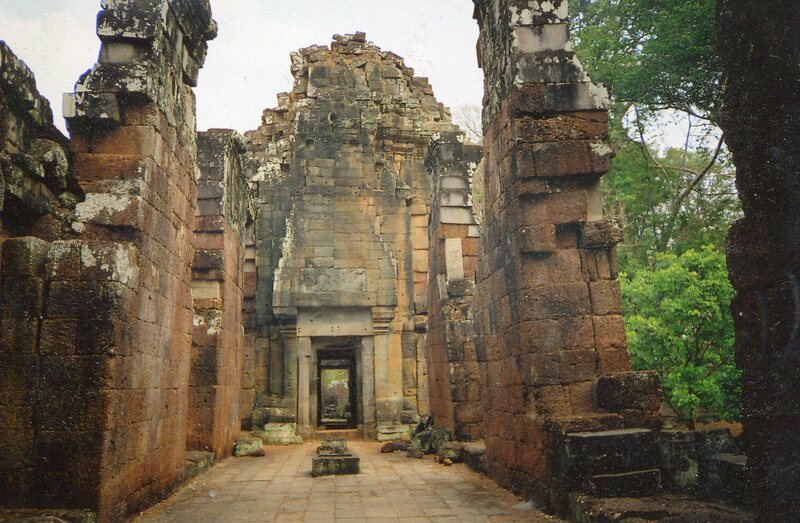 They were built in the early 13th century, and they face the royal palace at Angkor, so they must have had a special meaning. 1. Dignitaries might have watched the parade ground action from their tops. 2. Acrobats might have walked on tightropes between them. 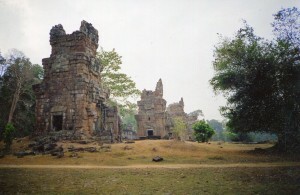 Their name, Prasat Suor Prat, means towers of the tightrope walkers. Both theories sound kind of fishy. 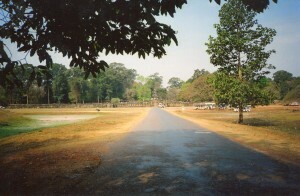 In the above photo, the parade ground stretches to the right of the towers. In the late thirteenth century, the Chinese businessman Zhou Daguan wrote that when two people had a public dispute, each sat in a tower, and emerged 1 to 4 days later. The guy who was wrong was always sick. This explanation sounds suspicious too. 12 was a sacred number in Hindu cosmology. Did each tower stand for a month? For a Hindu god? In the above photo, I’m in one the two long buildings that stand on the far side of the towers from the palace. They’re called khleangs. Inscriptions from the time say that dignitaries stayed in them while visiting the capital. I found them stately. Their walls are high and thick, with a central room and a long hall branching from each side (I’m at the end of a hall, looking towards the center, pretending to be a distinguished guest). The buildings are formal and symmetrical–fitting places for high-ranking foreign ambassadors. Whatever their purposes were, Prasat Suor Prat and the khleangs complemented the royal palace and the Elephant Terrace that they faced. Parades were flanked by buildings that projected aloof majesty. When you explore the buildings on both sides, you can start to envision the royal center’s grandeur. Only the stone and laterite remain, but these edifices once framed festivities that would have made the Super Bowl a yawn fest. Bright Flags and tents, bursting fireworks, ear-piercing conches and trumpets, beating drums, lithe dancers with sparkling jewelry and tiaras, and thundering elephants glittered between these buildings. Racing chariots, wrestlers, polo teams, and men on horseback fighting with spears stomped through here. Acrobats and jugglers added lilt to the visceral shows. 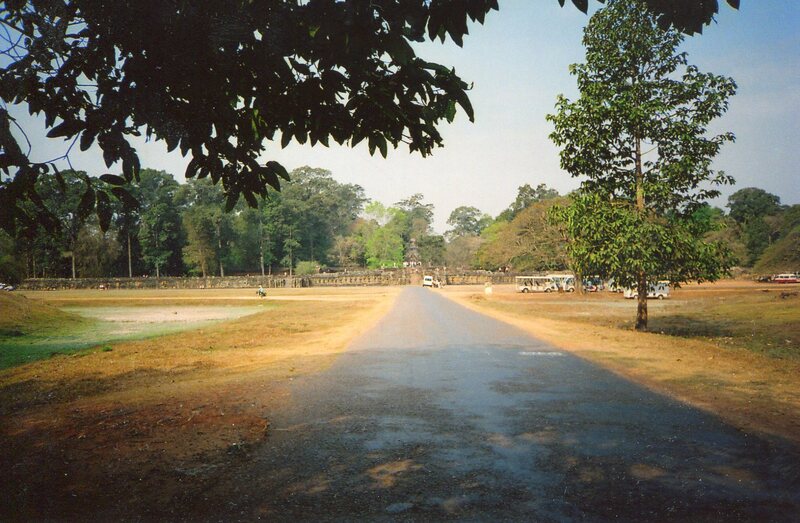 In its day, the Khmer royal palace ground was one of the most majestic places on earth. Today, young Cambodians enjoy the moment when they can, and hope for a bright future. I wish them all the glory of their ancestors.